Synopsis: MINI owners know how to accessorize! Up for some super simple interior customization? It doesn't get much easier than these Door Grab Bar Covers. 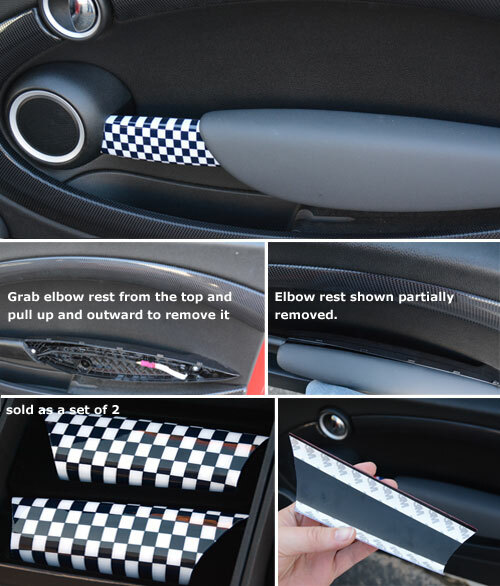 This set of formed door grab bar covers wrap around the contours of the left and right interior doors for a seemless look when installed and will turn an ordinary interior into a truly unique interior in a minute or so. Simply peel back the sticker backing, line them up on top of the grab bar and press them into place. Available in Checkered Flag, Black Union Jack, Paul Smith Style and Union Jack for a variety of Gen 2 and Gen 3 models.